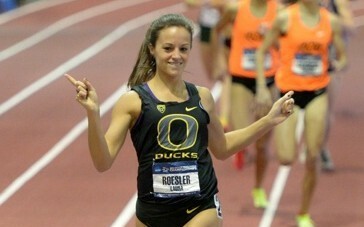 1st July 2014 – PACE Sports Management is pleased to announce the signing of NCAA Indoor and Outdoor 800m Champion Laura Roesler. The 22 year old from Fargo in North Dakota had a great career at the University of Oregon winning two NCAA 800m titles, three Pac-12 titles and becoming a 17 time All-American. At high school she won 22 state titles in events ranging from 100m to cross country. Last weekend Roesler showed her quality when finishing 2nd in the USATF Championships 800m final in Sacramento in a new personal best time of 1:59.04, the 5th fastest in the world this year. Laura will be coached by Rose Monday and is expected to make her Diamond League debut in Europe later this month.